With the Ling Cod season opener just a month away I always get excited about preparing gear and planning trips. I was looking through pictures from last year and came across the one above. 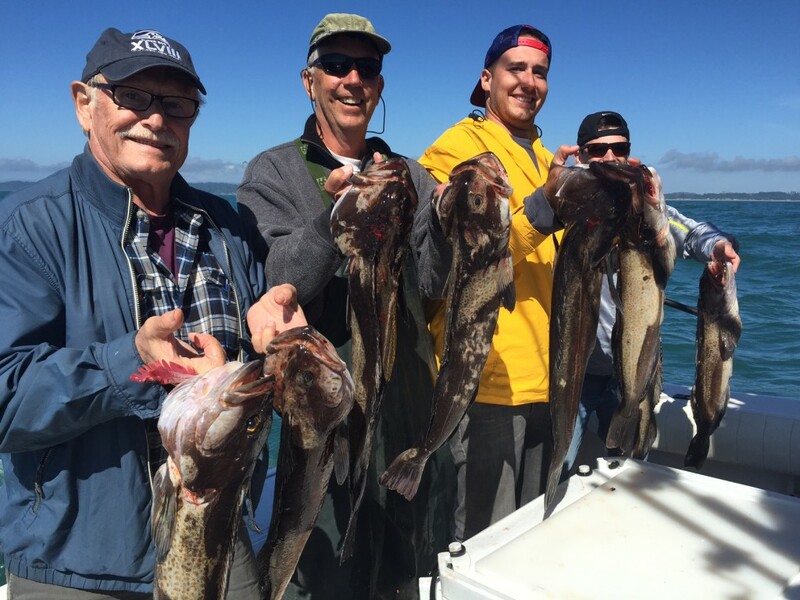 A day of Ling Cod and Sea Bass fishing can be a blast and a bit frustrating too. There are days that you can see the fish on your screen but they just don’t seem hungry and nothing you do seems to turn on the bite. Just be patient. Shrimp Flies, Small Metal jigs, and bait all will work but, some days one is a better producer than the others. Make sure you have a variety of baits when headed out. I use 6 to 12 ounces of lead and a dropper style rig. 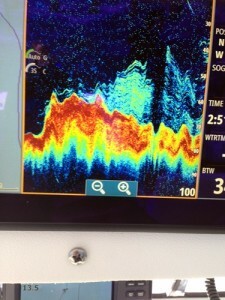 I took this screen shot (left) of my Simrad NSS EVO2 CHIRP unit just to show how well fish will show up. I have been using it for a year now and I am very impressed. 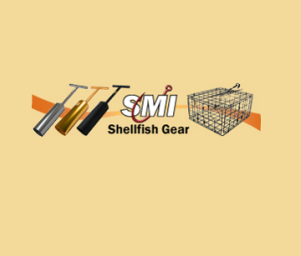 Clamming continues to be closed in the Westport – Grayland area. My guess is we will not see a dig this spring in our area. The Long beach area is open for Razor Clams. Crabbing continues to be good both from the docks and out in the bay. 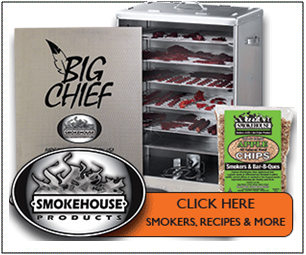 Fresh bait is the key here. As always Have Fun, Be Safe, and I’ll see you in Westport. Salmon fishing was fair to slow this past week in the San Juan Islands. The fish are really not sticking in one spot. Here today, gone tomorrow. You may have a poor day, fair day, or good day, but hey, at least it’s a day on the water! There are some nice Blackmouth to be had, you just have to hunt for them. Submitted by Kevin Klein, Fidalgo-SanJuan Islands Chapter PSA, CCA Northsound. The cover image of this week’s fishing reports was also contributed by Klein. The cover image of this week’s fishing reports was also contributed by Kevin. 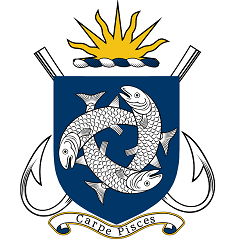 Basic Fishing Classes (Youth 8+) Parent or guardian welcome to register and learn with their youth . Cost $10 April 2, 2016 10 am to 12 noon at Point Defiance Marina. Pre-register at MetroParksTacoma.org/GO or call 253-591-5325 Learn beginning fundamentals for fresh and salt water angling including regulations, equipment, tackle, rigging, knots, casting, fish identification, landing and care for fish. Open daily from 6:30 am to 6:00 pm . This weekend I had good reason to celebrate. First and foremost my son Scott brought his family to celebrate my Valentine birthday and, secondly, to share with them two days of a very quality fishery. We have a lake we walk into this time and shore fish. It is about a mile walk in and at times a rough trail. In two days we landed 13 very quality rainbows with the smallest being 17-inches and the largest 20-incehs. 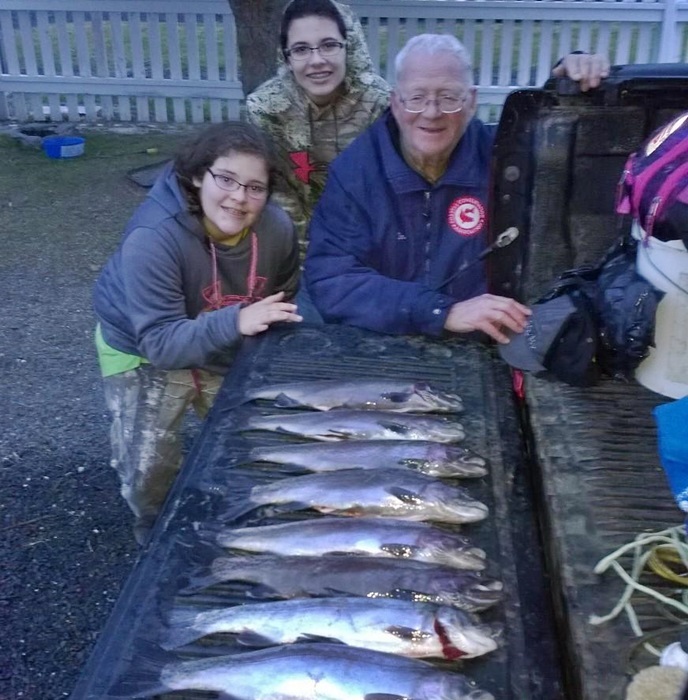 Pictured is the Saturday catch with granddaughters Ellie and Bridgette and myself. Potholes has seen several boats on the water with some perch over by Perch Point. Several fishermen have been fishing off the dam face for bass with others fishing in deeper water about 40 feet deep for Walleye. This week brings wind and rain, things I left when we moved over from the west side. Yesterday, as we started to pull in our driveway, we stopped abruptly as there were 12 deer in my side and back yard. Exciting way to end the weekend. Now we are for a short while at the mercy of the weather. Salmon fishing was GOOD for anglers in East Sooke. The largest salmon of the week was a 20.8 lb spring caught near the Trap Shack by Bob Pearson. Most of the fish from that area have been a lot smaller than that one. 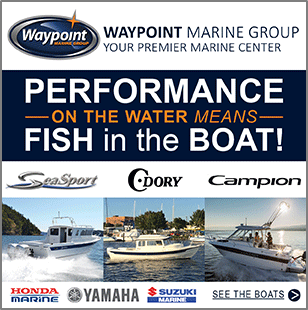 Anglers were reporting lots of springs in the bay just out from the Cheanuh Marina breakwater. Anchovies in glow teaser heads have been very effective in luring the winter springs. Spoons, such as the G-Force and Skinny G, in Cop Car, Bon Chovy or Irish Cream colours were effective. For flashers, the Madi, Lemon Lime and Purple Onion have been good. Salmon fishing was GOOD this past week. The Flats have been holding some nice fish recently for those trolling close to the bottom. Good lures have been Green Splatterback Coho Killers, Skinny G spoons and APT Needlefish spoons. Halibut fishing was FAIR over the weekend. Tara Bardal caught a 62.6 lb halibut on salmon using salmon belly. Good areas were Haro Strait and Discover Island. Anglers that were fishing were using extra large herring, salmon bellies and/or octopus for bait. Berkley Gulp and Powerbait soft plastics also work very well. You can also use Mudraker, Lucky or other large Jigs if you want to stay away from the dogfish. Salmon fishing was GOOD, just like last week. There were lots of springs in the 3-5 lb range but larger fish are more scattered. The trolling pattern has been doing figure eights between the Deep Hole and the Can Buoy. The anglers are fishing close to the bottom and often bouncing the downrigger balls on the bottom, in 120-150 feet of water. There is still a lot of bait right inside the bay. Small spoons, such as the G-Force, Coyote and Gypsy, in the glow and/or any bright colours were very effective. Hootchies and squirts also produced well. Flashers that remain popular include Glow green, Lemon-Lime and Purple Onion. And you can’t go wrong fishing anchovies in a Bloody Nose teaser. Halibut fishing was SLOW over the weekend. Best areas were Race Rocks, William Head and Constance Bank. Anglers that were fishing were using extra large herring, salmon bellies and/or octopus for bait. Berkley Gulp and Powerbait soft plastics also work very well. You can also use Mudraker, Lucky or other large Jigs if you want to stay away from the dogfish. Salmon fishing was FAIR near Sidney. There were three 14 lb springs landed this past week. Coal Island and Sidney Spit produced the fish. The majority of the winter springs caught recently have been short of the minimum size for retention and most areas have some fish. Most anglers are fishing using anchovies in Bloody Nose and UV Green teaser heads. Coho Killer spoons have also been working well, especially in double glow and Gold Nugget. Fishing for salmon was GOOD off Victoria. The fish were plentiful near Albert Head (on the pinnacles) and near Esquimalt, but were not very large. Constance Bank has been good and Brotchie Ledge to Ross Bay has also produced some fish. 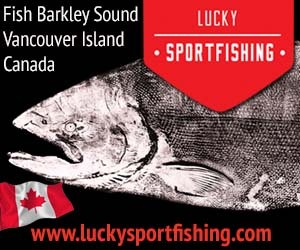 The Esquimalt Anglers held an informal salmon derby on the weekend and Gary Bromley won it with an 11.4 lb spring. It just edged an 11.1 lb spring to take the top prize. Spoons and squirts were successful in getting hook ups. Bloody Nose and Purple Haze have been the most popular colors for teaser heads. Good choices in plastic baits are the Electric Chair, Purple Haze and White Glow. Coho Killers, AP Needlefish, G Force and Coyote spoons in Green Splatterback, Moon Glow and Cop Car colours have also been good. The Purple Onion, Lemon Lime and Madi. Halibut fishing was GOOD over the weekend. There were quite a few halibut taken at Constance Bank on the weekend. Wayne Boyd brought in a 132 cm, 68.4 lb halibut to take the first place on our Halibut Leader Board. Alexander Janssen brought in a nice 131 cm, 58.5 lb halibut for second place. Anglers that were fishing were using extra large herring, salmon bellies and/or octopus for bait. Berkley Gulp and Powerbait soft plastics also work very well. You can also use Mudraker, Lucky or other large Jigs if you want to stay away from the dogfish. The River is high and running hard. The water level at the lake today was just over 2.04 meters and at 1.76 meters near Duncan. Although, it’s dirty and brown, anglers have been catching both steelhead and brown trout in the Riverbottom area, mostly from drift boats. For steelhead, good lures to fish are Spin ‘n Glo’s, Beads and yarn, Gooey Bobs and the always reliable Pink Worm. Spoons can also be a great lure in these conditions. Fly fishing for brown trout at the top end of the river has been good. Trout fishing was FAIR on most lakes in the South Island area this past week. Cowichan Lake has produced some large cutthroat trout for those trolling 3” plugs, but that is strictly a catch and release fishery for large trout. Takin Marvasti went fishing on Monday at lda Anne Lake in Langford and caught a 20”, 3 pound 5 oz female rainbow trout on Powerbait.